When I was a young child, I remember the adults around me asking, “What do you want to be when you grow up?” It was always a daunting question. Even though I felt like I SHOULD have an answer, my replies tended to sound vague and uncertain. “You can’t make a living being a musician or a writer!” would come the response. With no other ideas at hand, I would just shrug my shoulders and be silent. In college, it took me so long to choose a major that the registration department finally had to refuse my enrollment during the second semester of my Junior year. They would only permit me to register for classes once I decided to major in SOMETHING. Lack of focus, one might call it. But many years later, when I started studying meditation, it seemed to me that the question, itself, was not framed properly. It wasn’t a question of what I wanted “to be” when I grew up. It was a question of what my soul incarnated on the planet to DO. That question was much more interesting and far more valuable. That question evoked a multi-dimensional answer which continued to evolve as I grew older and, hopefully, wiser. Yogi Bhajan calls it the difference between fate and destiny. Destiny is living according to what the soul took birth to do. It is the deep wisdom within ourselves, constantly illuminating the path before us. Destiny can involve choices that make no sense, risks that we’d rather not take, challenges that make us want to hide under the covers, and opportunities that push us past our limits. Destiny may not always feel safe and secure. But when we live according to destiny, it gives us a profound sense of satisfaction. Fate, on, the other hand, is what we live when we let the time and space around us dictate our reality. When the pressures of society drown out the voice of the spirit. When other people’s expectations over-ride any sense of self-expectation. Or even just simply when we forget about death – when we forget how temporary and impermanent our time on the earth really is. If we get lost in the belief that we always have tomorrow, then we may let what’s important slip through our fingers. "All this chanting, the religious rituals and religious ceremonies— the whole life we live— is for that last moment. There comes a moment before death when you are judged in the trinity of you, your destiny, and your fate. And that judgment is your decision—nobody else’s. "– Yogi Bhajan. Nobody can know another person’s fate or destiny for them. We can only know it for ourselves, through our own self-reflection. The moment of death is the final measure of how the soul used its time on the earth. But every day, through meditation and prayer, we have a chance to asses ourselves. How much did I live my fate today? How much did I live my destiny? I have two little tricks that I use to reflect back to myself how I’m doing in the journey of life. The first is, “Ek Ong Kaar – if you were to win the lottery tomorrow – would you still keep doing what you’re doing?” If the answer is yes, I know I’m on track. If it’s no – I know something needs to change. The second question is, “If today was the last day of your life, would you die feeling happy and complete?” If the answer is yes – keep going. If it’s no – figure out what you need to do differently. On the road to success, our family, peers, schools and counselors rarely ask us, “What did your soul take birth to do?” And yet, it is the most important question. When measured against how little time we actually have here, the ultimate success comes from knowing I walked my destiny as best I could. 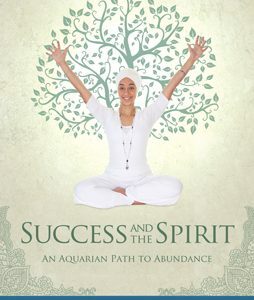 Editor’s Note: Success and the Spirit: An Aquarian Path to Abundance contains the wisdom and teachings of Sikh Dharma and Kundalini Yoga as taught by the Siri Singh Sahib, Yogi Bhajan. It will be released at Summer Solstice 2011. More information can be found on Sikh Dharma International. This post was originally published on the Spirit Voyage blog. its a nice explanation but dont you think that God is miser if there are only two paths to reach HIM. there are millions and milions of paths to God, its upto us what we like.like, Like, Guru Nanak Dev G has said "Hukm rajae chalna Nanak likhia naal", we should make an endeavour to live in His Hukm, and the enjoy the biggest blessing given to us i.e Life.